Have you ever seen that incredible shrinking hose on late night television commercials? I’ve got a news flash for you . . . they don’t work. We thought we’d found the answer to our problems and could get rid of our hose holder but alas, it wasn’t to be. So instead of coming up with ways to get rid of our hose holder, we decided instead to build our own. 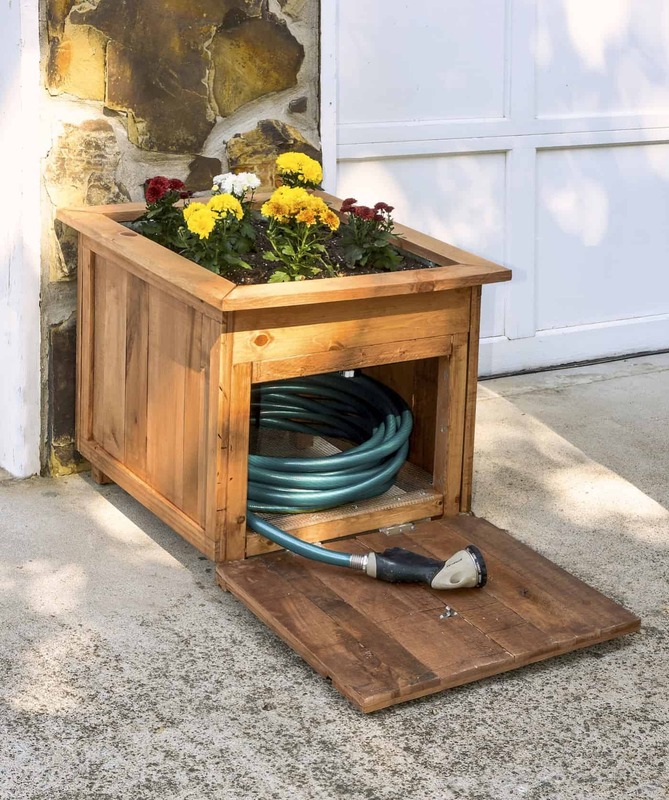 Yes – we embraced the idea of a hose caddy. 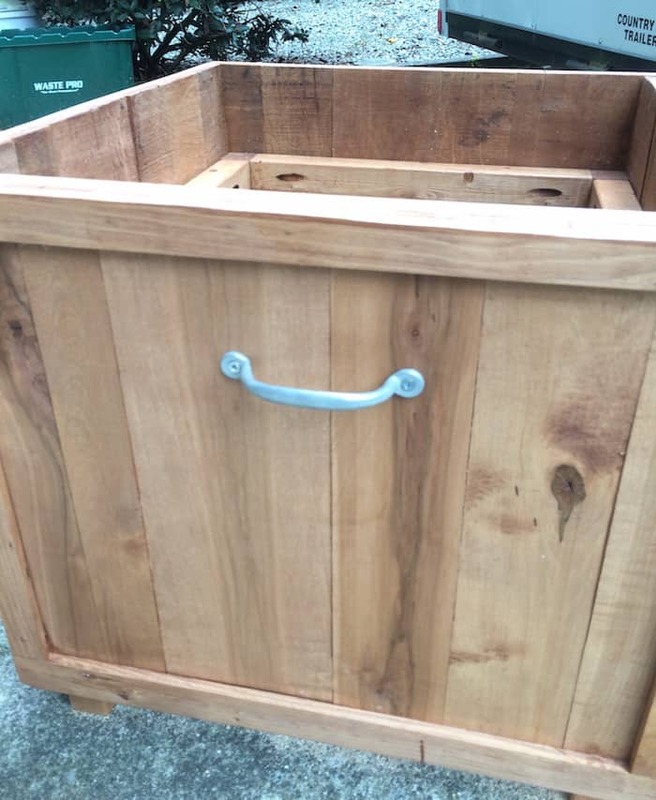 But we also decided we could make it prettier than a regular hose caddy, and that we could make it out of pallet wood. Which after this table and this art, we had copious amounts of laying around. Turns out we weren’t the first people to come up with this idea – we found this version and this version online. 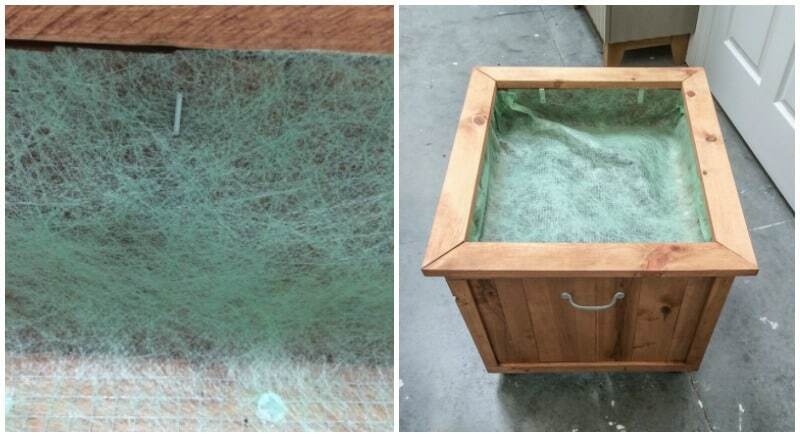 As any good DIYer does, they make their own version that works for them, and that’s exactly what we did! It’s perfect for holding a hose, and when it’s not in use, it looks so pretty. As with any project, the supplies and instructions might seem complicated, but they really aren’t. Do a quick read through before you begin. 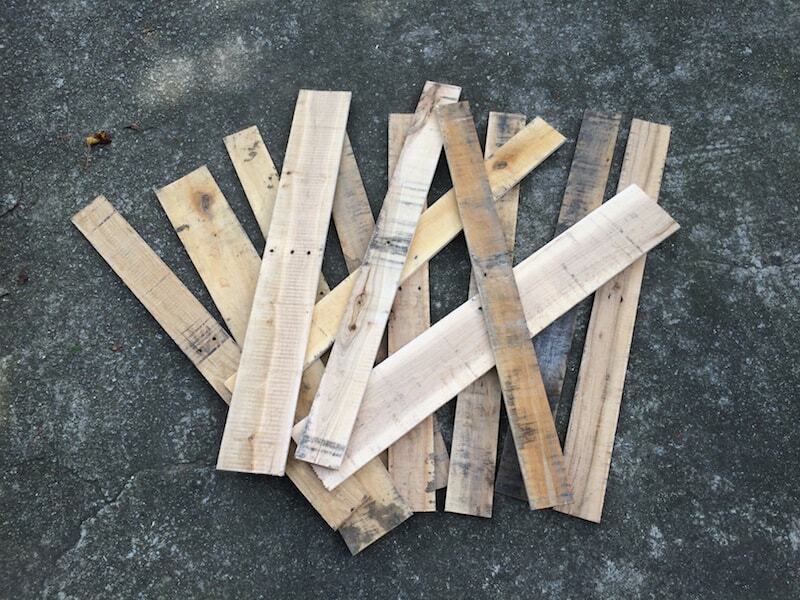 Gather your pallet wood. If you need to learn how to dismantle a pallet, check out this video. 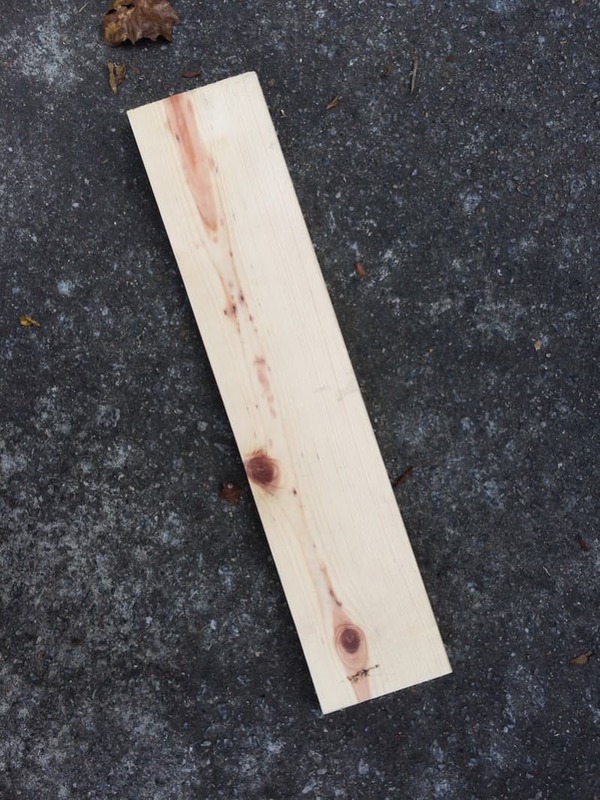 Using a planer, plane your pallet wood planks to a uniform thickness; approximately 1/2″. IMPORTANT NOTE: after you plane the wood, we highly recommend letting it sit in a dry environment for a few weeks to dry. The wood WILL shrink (we learned from experience)! Use a miter saw to cut your planed pallet planks to 17” lengths. Lay them out – they will be varying widths, which is fine. The goal is to form four 17”x20” panels as you see above (you may have to cut the widths of some of your planks to accomplish this). Do not attach anything yet. Now you’ll make cross pieces for the top and bottom. 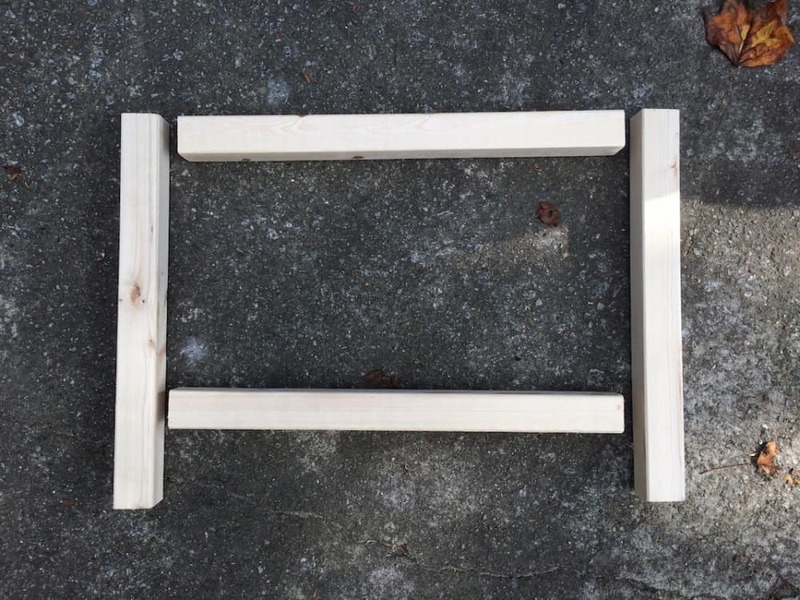 Use a miter saw to cut some of your remaining pallet wood into your top and bottom panel trim pieces (1.25”W x 20”L x .5”T). You’ll need eight pieces total. 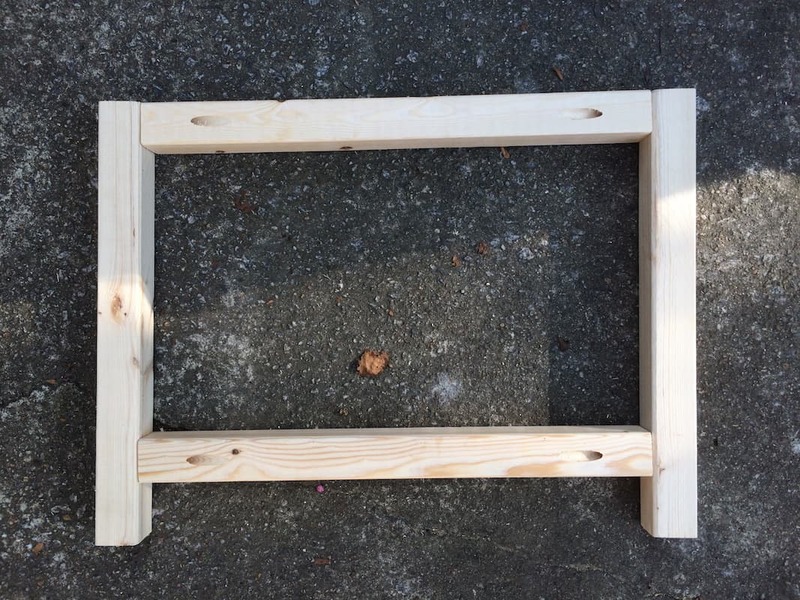 Now you’ll finish out the frame for each panel with additional side trim pieces. Use a miter saw to cut additional pallet wood your side panel trim pieces (1.25”W x 15.5”L x .5”T) – you’ll need eight pieces. You’ll attach everything in the next step. 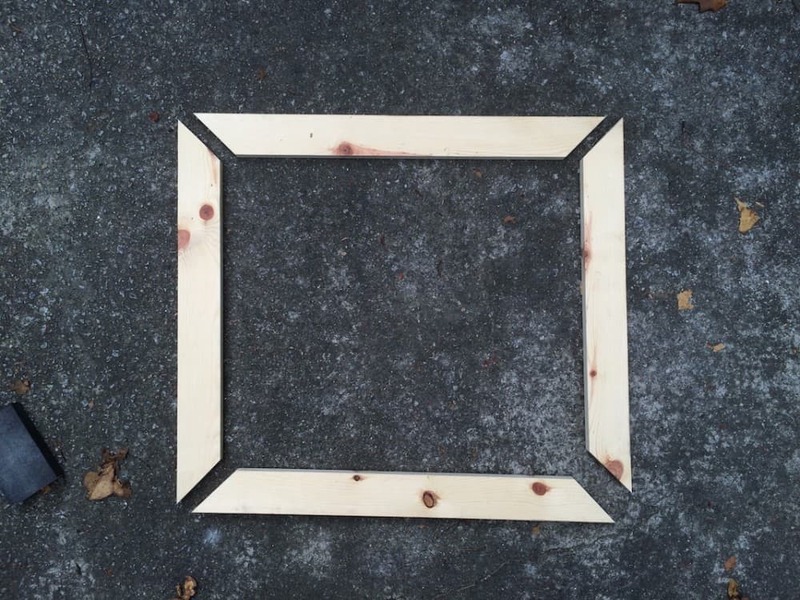 Assemble all four frames with the wood pieces. Do this by laying out one frame face down as shown on the upper left. 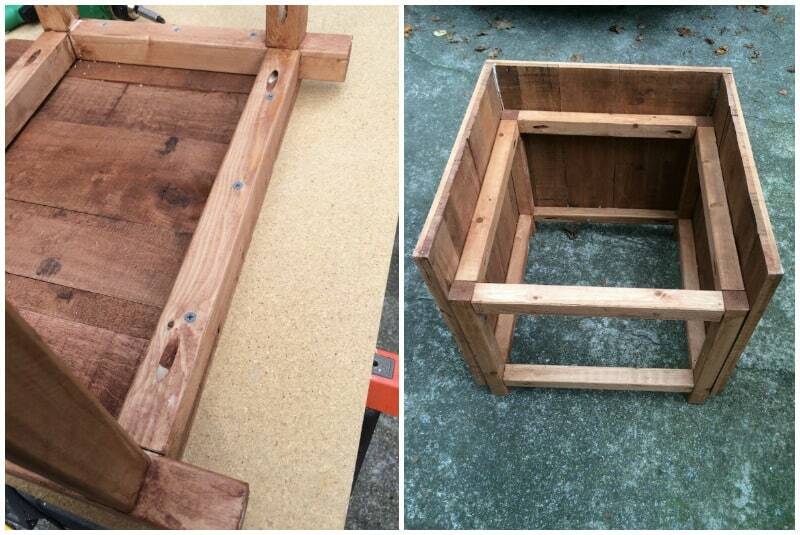 Add your wood glue around the exterior, then place the pallet wood pieces face down on top to secure. Complete one panel and then finish the other three. 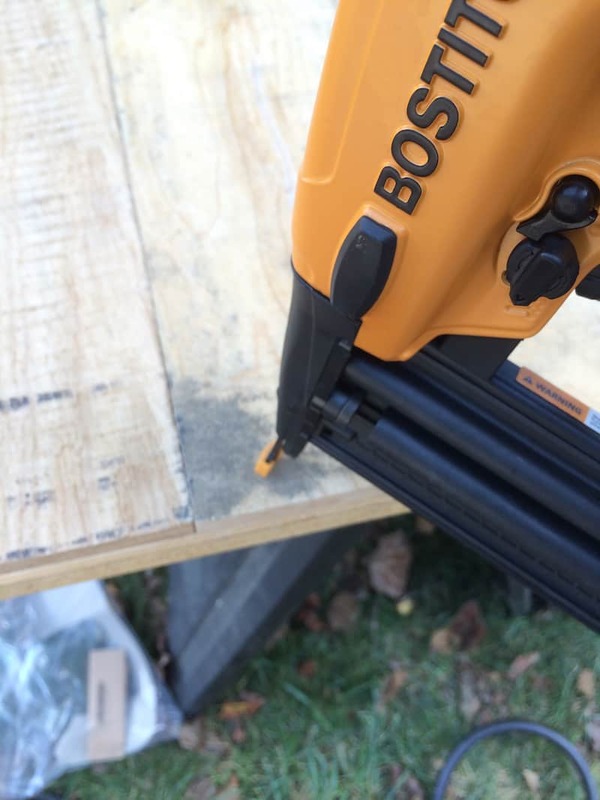 Use a nail gun to reinforce the panels you just glued. We did this right away after gluing – no need to let dry. Use 3/4″ nails. Let your external panel pieces dry. Now you’re going to work on the internal frame of the hose holder. 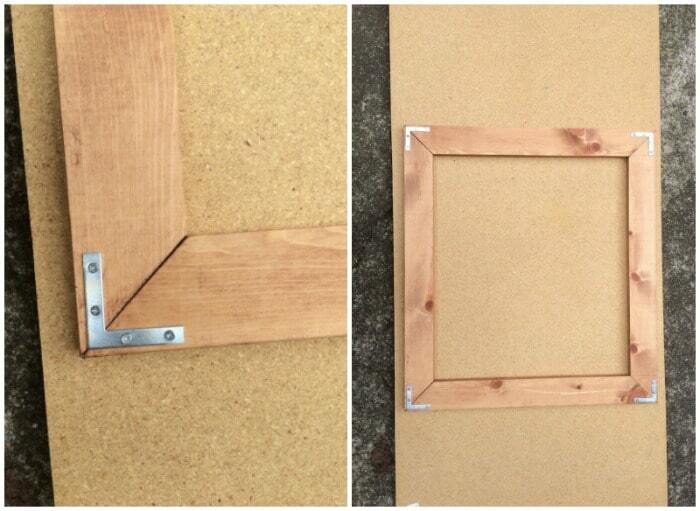 Now start cutting your internal frame pieces using 2x2s and a miter saw. 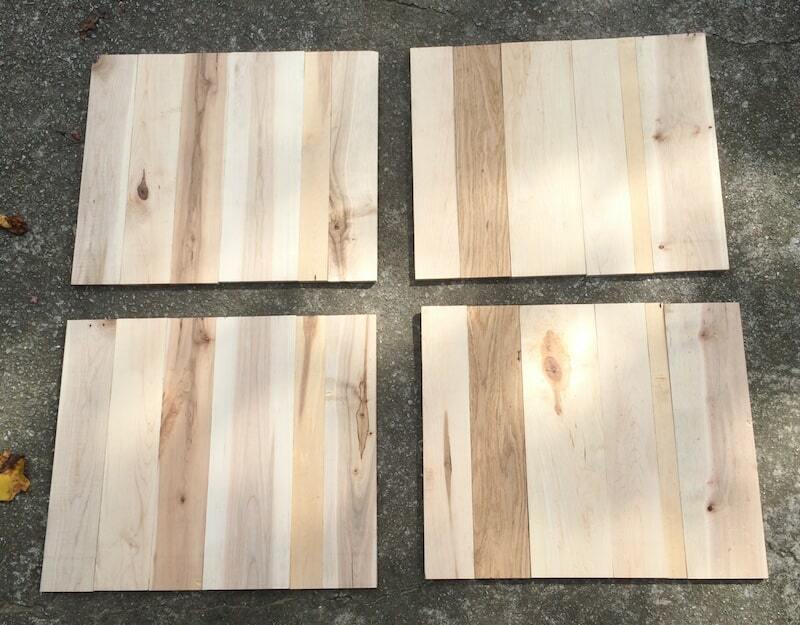 Cut four pieces 15″ long, four pieces 17.5″ long, and four pieces 15.5″ long. 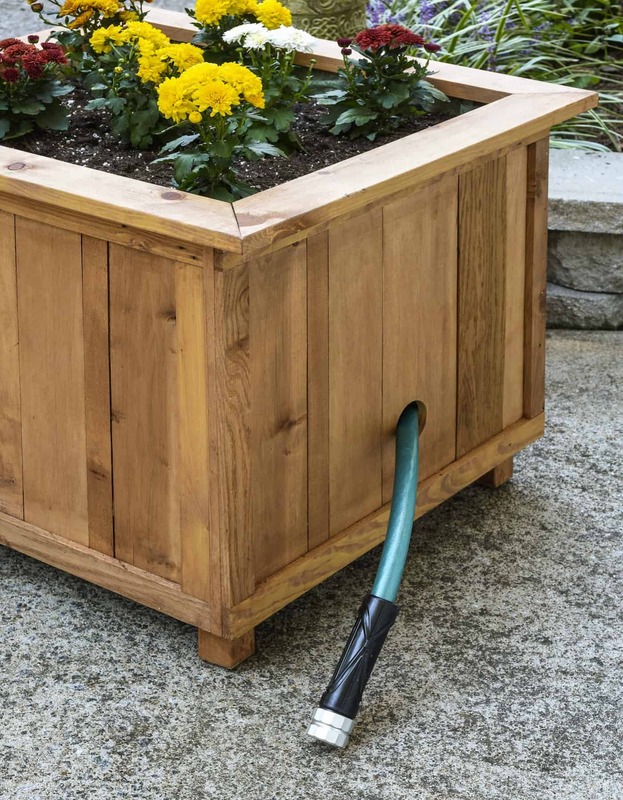 Your hose holder is going to be deeper than it is wide! Assemble the longer SIDES first . 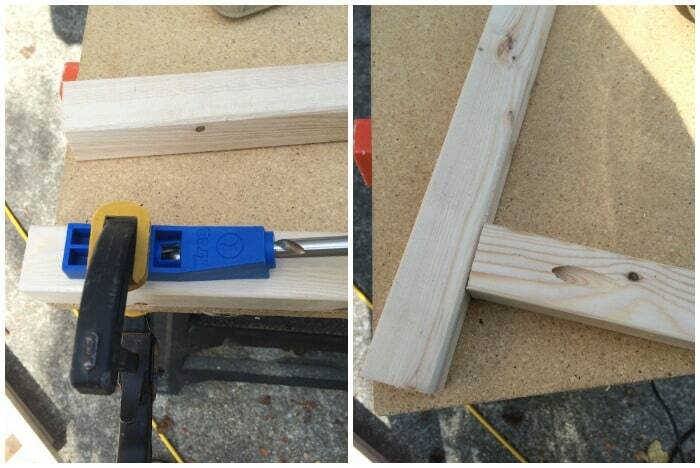 . . using a Kreg jig. 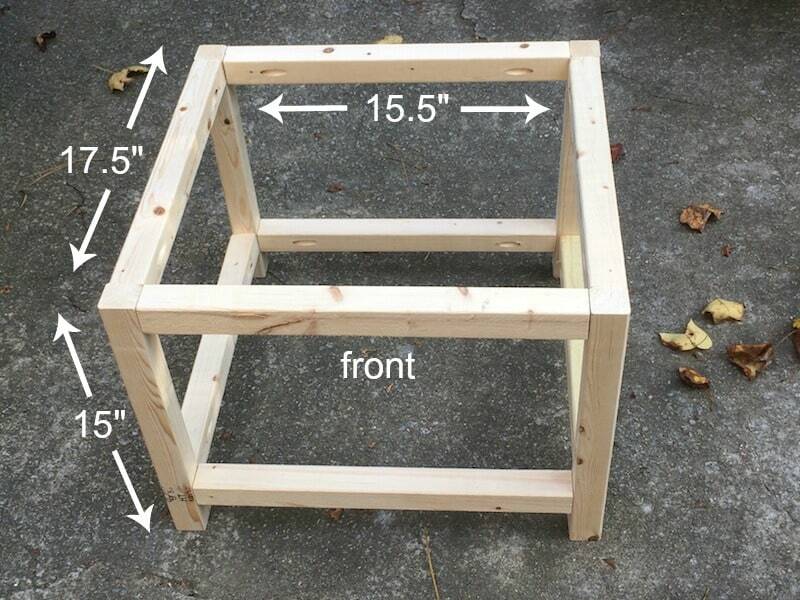 This is your “skeleton” for the panels and the planter box on the top. On the front side of the planter, there is a piece behind the door. You’ll see how it attaches later, but for now, use your miter saw to cut a piece of planed pallet wood to 4”Wx18.25”Lx.5”T. Now cut the top frame that will go around the planter box area. 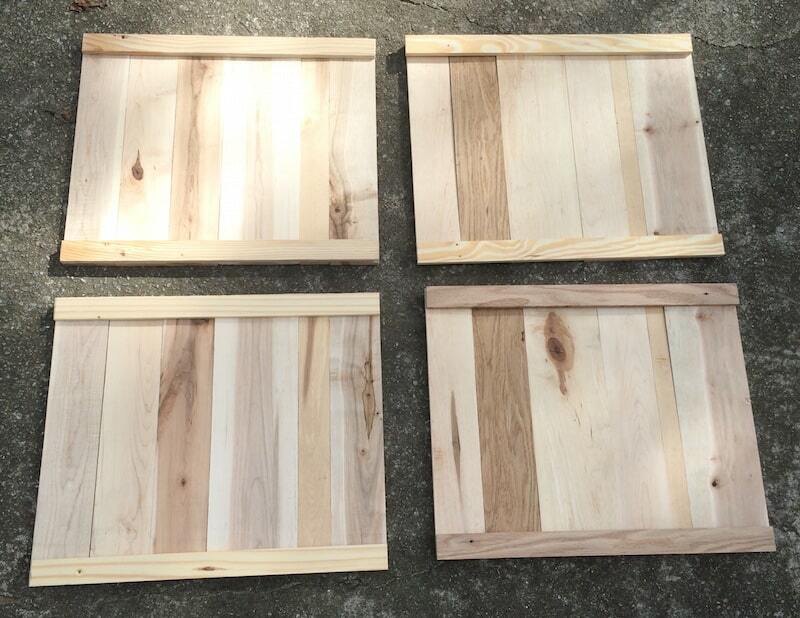 Use a miter saw to cut four pieces of planed pallet wood: two pieces 24”L x 2.5”W x .5” thick and two pieces 22”L x 2.5”W x .5” thick. Cut a 45º angle at each end. Before assembly, stain all your components. At least that’s what we did, because it was very easy to do it that way. 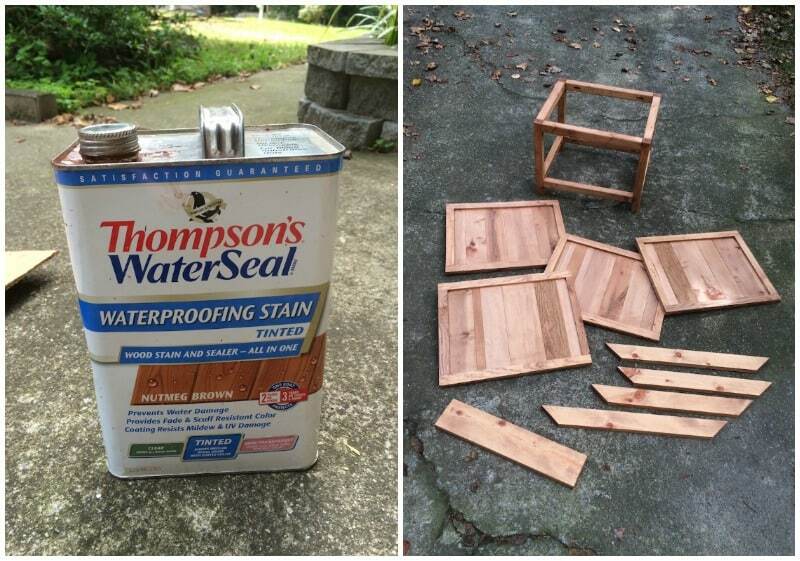 Follow the instructions on your stain container for best application. Let dry. Then start assembling your hose caddy! Decide which side is the front. 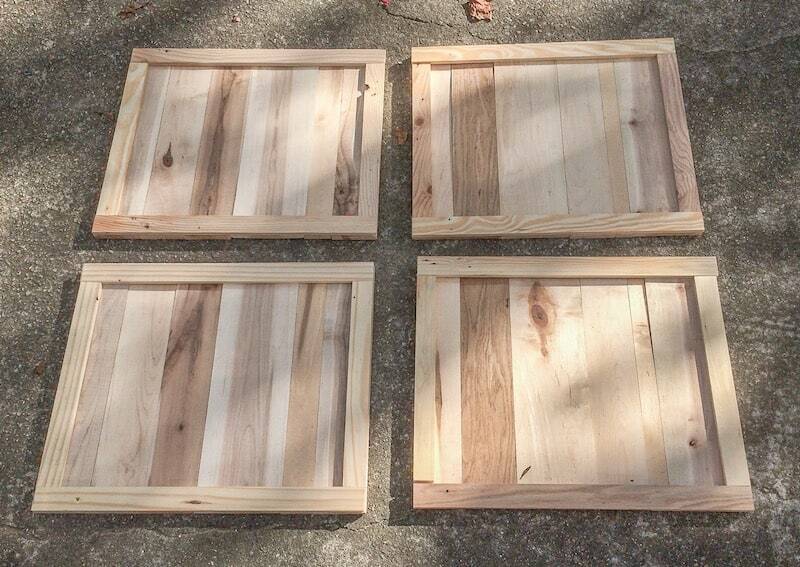 On the other three sides, glue the panels on and then screw in with 2″ wood screws. Let the wood glue dry. On the front, glue in your panel. 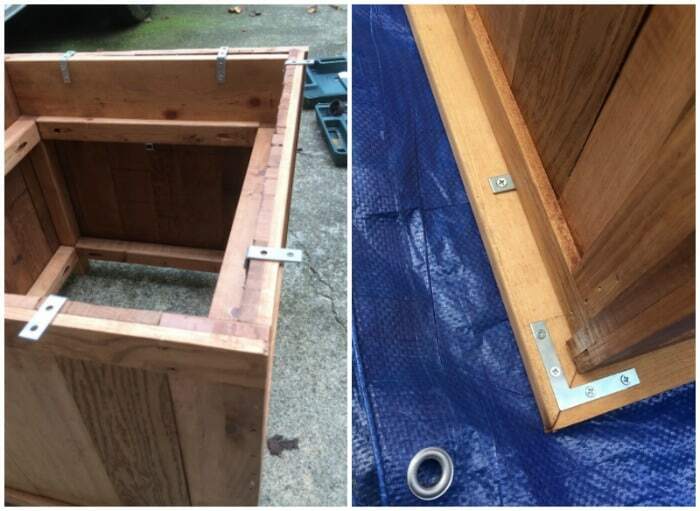 Add a little nail gun action to the sides to secure. Let dry. Attach the hinges to the last panel. 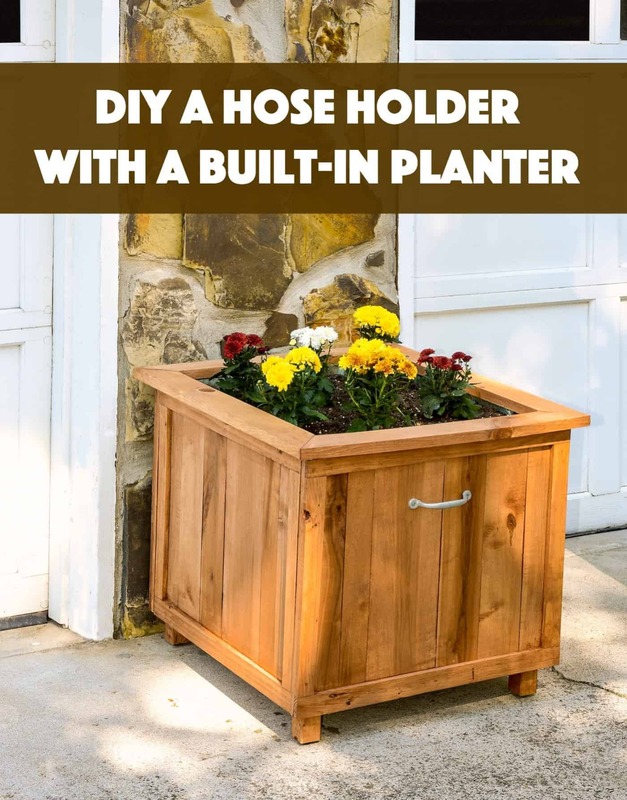 Attach these hinges to the hose holder. Attach the female part of the door latch to the top of the door opening in the center. Attach the male part of the door latch to the corresponding spot on the inside of the front door. Attempt opening and closing before securing down completely! Attach a handle to the front of the door. 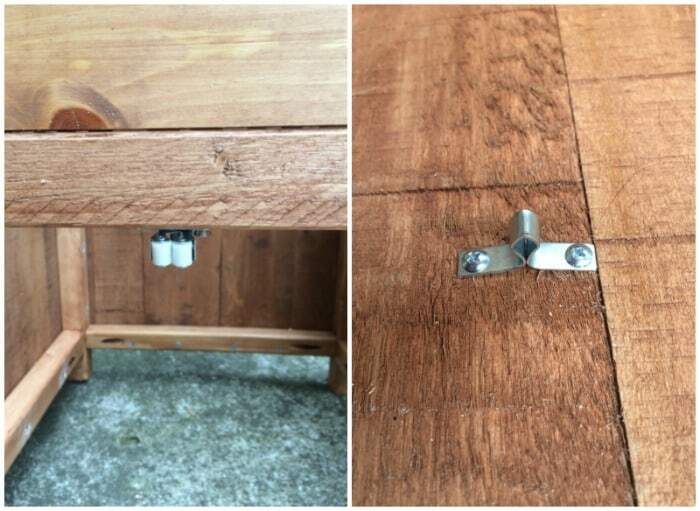 Secure the remaining pieces of wood together with your four L-brackets (packets come with screws). Attach eight right angle brackets (two on each side) to the panels of your hose caddy as shown above on the left (brackets come with screws). 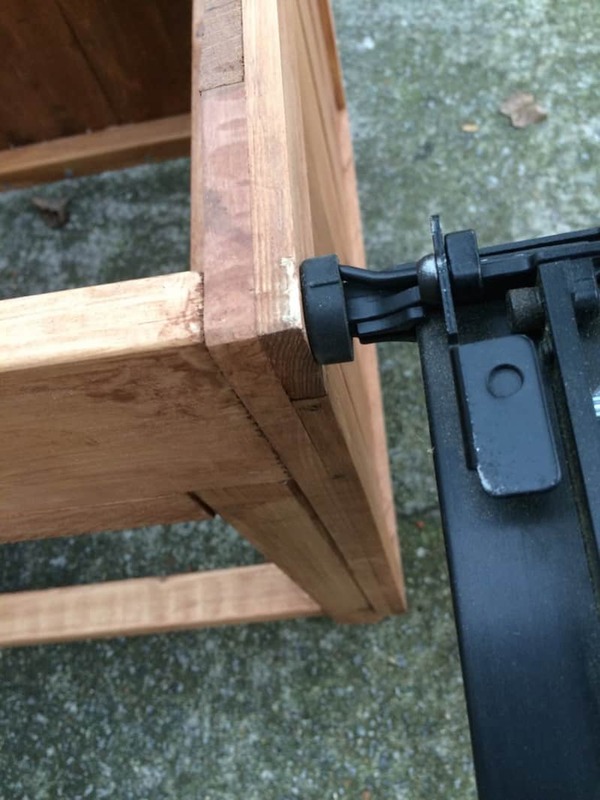 Flip the entire holder over and center it on the frame held together by L-brackets. Screw the right angle brackets into that top frame. Our packets came with screws and those were the ones we used. Cut two pieces of ¼” mesh hardware cloth into 18.25” x 20” sheets. Cut 2” out of all of the corners of one piece – this will be the inside bottom. The uncut piece will be the inside top. Take the piece of hardware cloth with the corners cut and place it in the inside bottom. 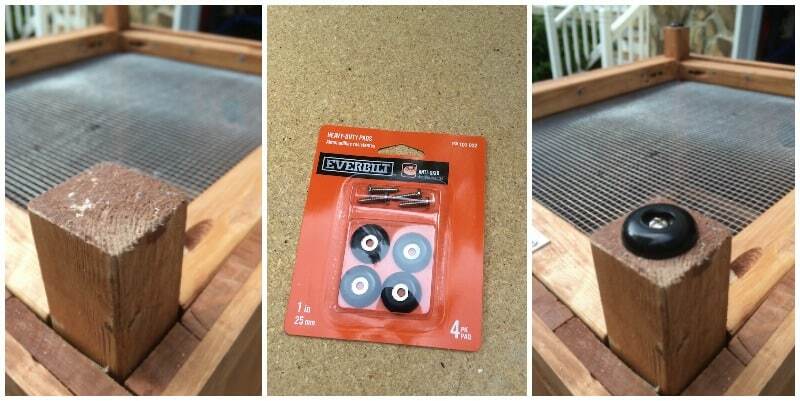 Use ½” wood screws to attach it. Do the same with the uncut piece on the inside top. 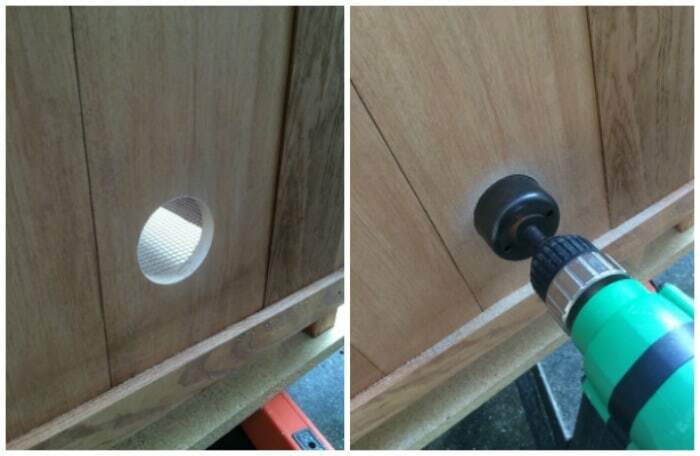 Use a doorknob hole jig to drill out a hole in the center of the lower back panel; this is where the hose will come through. On the bottom of the feet, use heavy duty plastic foot pads if it is going to sit on a driveway or other paved surface. It will also keep the feet from sitting directly in water. 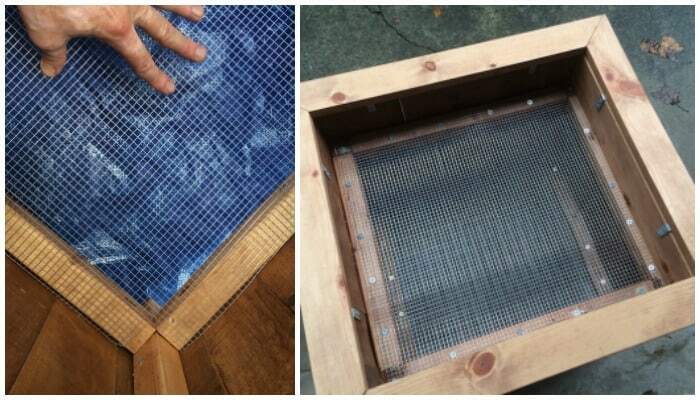 Take landscaping cloth, cut it, and staple it on top of the top piece of hardware cloth. Use two layers and be sure to cover the sides as well. 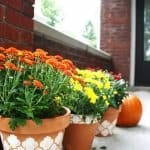 Plant your plants! I didn’t include those supplies in the list because what you plant is up to you. Isn’t it wonderful? Here’s the back. 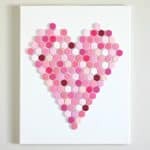 Such a lovely and practical project! Amy, this could be one of the most clever outdoor projects I’ve seen! Love it! Oh my goodness! Genius!! I need one of these ASAP. This is an awesome project. 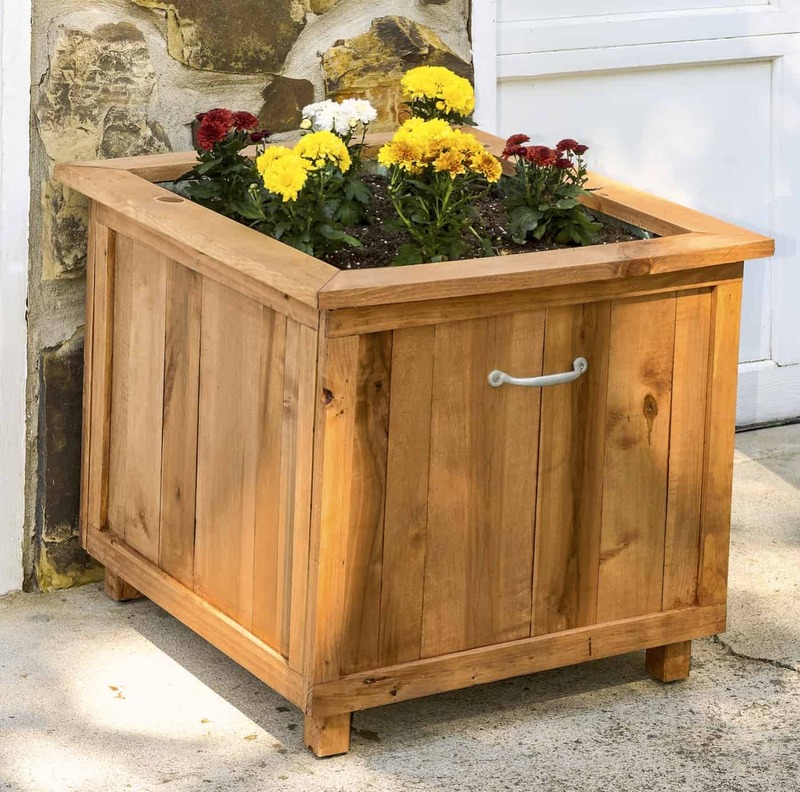 It looks so pretty and I would never know that there is a hose inside! Love this!! I need one for my yard! I love this! No one would ever guess it holds a hose! My wife loves it, thanks for the very detailed instructions! When you water the plants does the hose get all muddy and wet?? 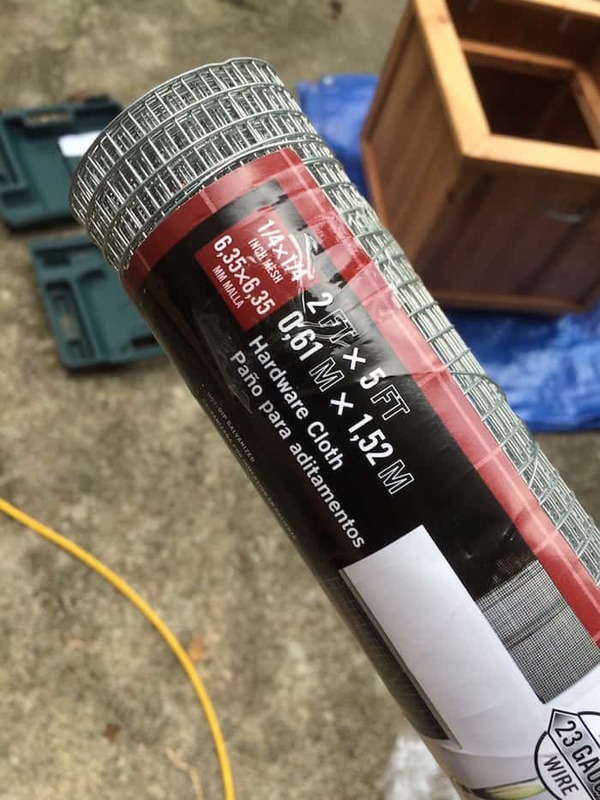 The trim boards that are 1.25″ X 15.5″ are too long. It should be 14.5″. It’s so pretty Amy! Will try to make one someday. Love it. Great design! I have plans on making it slightly taller and adding a crank system to it. I’ll post it on here when I finish it. Brittany I can’t wait to see it! Yes, please share.